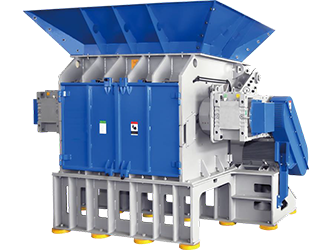 The T single shaft shredders are specially designed for the processing of complete or pre shred tires. All machines feature a 750 mm diameter rotor with width options 1500 mm to 3000 mm with oversized outboard bearings and twin gear drives. The tangential infeed ensures optimal feeding of the input materials while eliminating the need for a hydraulic feeding system. All tire shredders are equipped with a complete wear package, including rotor hard facing plus special knives and wear plates made from highly wear resistant steel. The T ranges differ in the number of stator knives and the screen sizes used. The modular design makes it easy to integrate either machine into existing installations. The X with its single row of stator knives is used to pre-shred complete car tires or large pieces of pre-reduced truck tires down to a size of approx 150 mm. The twin rows of stator knives and screen in the T enable it to process the tire shreds down to any required size > 20 mm. The unique machine design combined with the variable cutting gap create an optimal separation of rubber and steel fractions when the machine is used with 20 mm screen. Therefore steel can be removed easily in the following process with magnetic separation equipment. The machines are also used in the processing of RDF and other alternative fuel applications. The Virtus Equipment tire shredders use special highly wear resistant tungsten carbide flat knives, these knives ensure a long lifetime working with abrasive and contaminated materials. The T shredders are equipped with a large diameter flat rotors with weld on hard facing. The knives are fixed in special knife holders fitted in machined pockets.